FORT VALLEY, Ga. — An 18-year-old student was on one end of the phone, mostly quiet, while recording a conversation that would become the beginning of Fort Valley State University Police Sergeant Wilbur Bryant’s legal troubles. “Everyone has a freak inside of them. You just got to pull it out of them,” the 52-year-old is heard in the recording, telling the freshman student. “True,” the student replied, shyly. “That tells you that I'm really into you. It's not a joke. It's just like coming to your [dorm] room. You've got cameras in the hallway so if you go back and pull the camera, they see what room I went to. You follow me?” Bryant continued. That recorded phone conversation is now part of a criminal investigation by the Georgia Bureau of Investigation into the campus police officer. It goes on for about an hour. The character of the man on the phone is in stark contrast to the Sgt. Wilbur his employment records show. Performance reviews going back 10 years paint a picture of the decorated police sergeant that would make any boss proud. 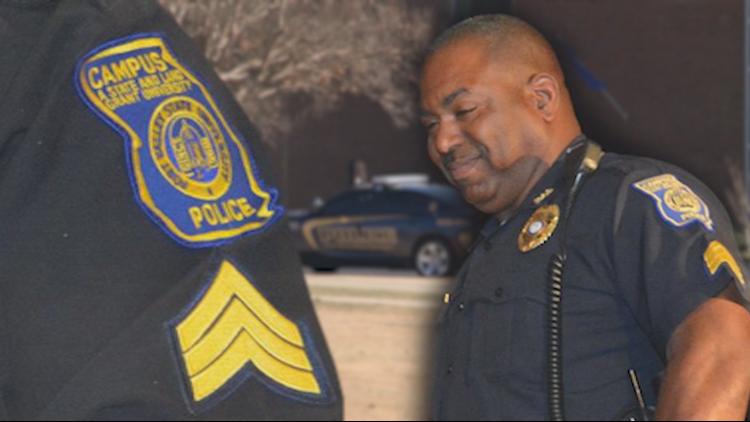 By all appearances, the veteran police officer was highly-regarded on the Fort Valley State University campus. He was part of the university president's security detail, and, in charge of the school's fire safety program. That's how Shanae Hall said her 18-year-old daughter told her she first saw the officer. “He had already seen her at a fire drill, so he had his eyes on her from the beginning,” Hall said. A few weeks later, Sgt. Bryant arrested the freshman for fighting with classmates on campus. It was a misdemeanor charge which was later dismissed. Hall said after that encounter, Sgt. Bryant used the phone number her daughter put on the police report to initiate an inappropriate personal relationship. “Her first thing was, this officer is really nice. He's trying to help me with my case and is going to help me get a job on campus. He's looking out for me,” the freshman's mother said. Sgt. Bryant was still in full uniform with a service weapon by his side when, according to court documents, he “forced” himself into Hall's daughter's dorm room. “[My daughter] was an athlete. She had to stay and train. All the other students are gone. He goes up, swipes his badge to get into the dorm facility and then comes up to her room. Then, he knocked on the door and just started explaining, you know, that they should basically be a couple and what he can offer and their friendship,” Hall said. The university refuses to release the video showing Bryant walking into the dorm room, citing pending litigation. Hall said Bryant offered her daughter gifts, out of town trips and made other promises to try to get her daughter to develop a sexual relationship with him. Hall turned that recording over to attorney Kenneth Lewis who's now representing the family against Bryant, the university and the Board of Regents in a lawsuit. “I think part of the reason that this culture and Officer Bryant was so emboldened to say the things he said on that tape was he's never had any repercussions,” Lewis said. 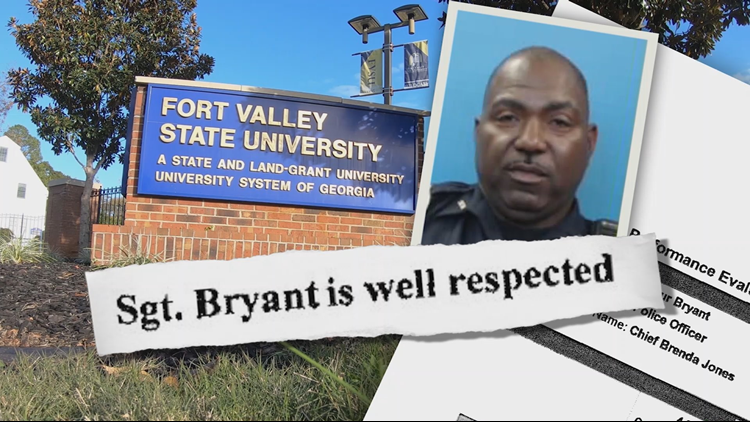 Our investigation has uncovered that the freshman's complaint against Bryant is just one on a list of sexual assault, inappropriate contact and harassment allegations against the officer going back a decade at the Fort Valley State University campus police department. The school's internal review files show half a dozen other coworkers and students have also alleged varying degrees of misconduct, mostly sexual in nature, against Bryant, in writing. Kellie Williams, a former campus security officer, said Bryant should have been fired a decade ago when she filed a sexual misconduct claim against him in 2011. 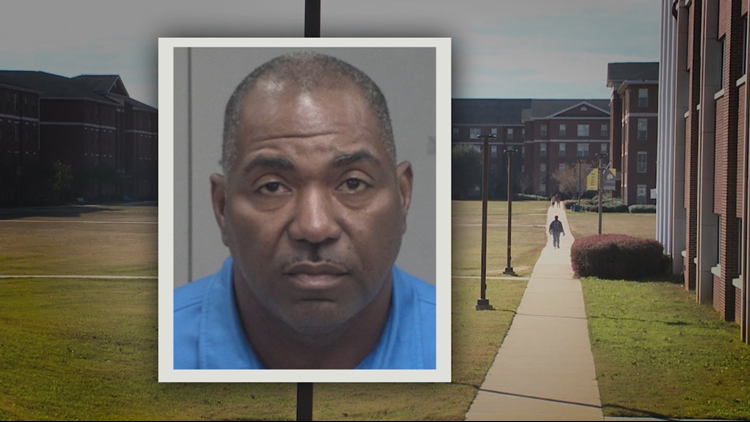 Williams said instead of the gas station, Bryant drove her to a dark area of campus sexually assaulted her. “He started pulling all of my clothes off. And I was saying no,” Williams said. “Right there and then. 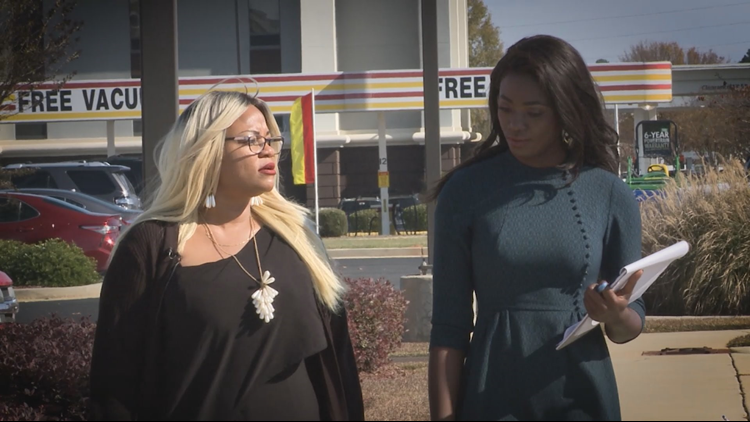 In the car?” 11Alive Investigative Reporter Faith Abubey asked. Sgt. Bryant stopped that night but Williams said he used his authority over her to continue a non-consensual sexual relationship - all of which Williams later reported, according to documents obtained by 11Alive in an Open Records request. In 2011, another coworker reported Bryant for sexual harassment. The school closed its internal investigation but later that same year, wrote in a report that it should have continued and taken action against Bryant in that case. 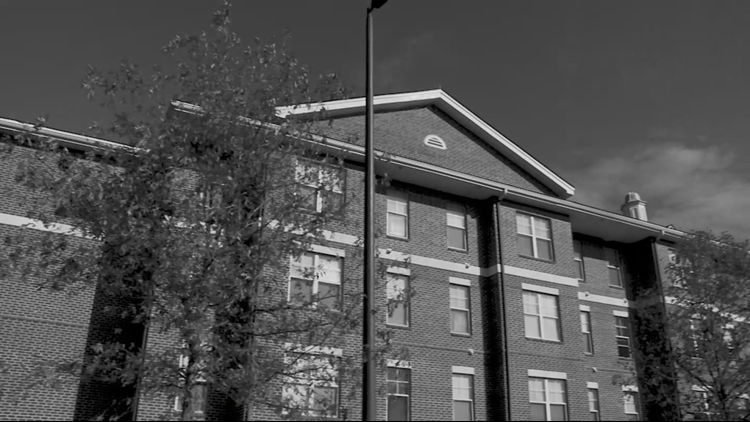 Another internal investigation revealed a former student reported that Sgt. Bryant damaged her car after she broke off a relationship with him. Bryant responded to the allegation by saying she was a friend. Another document from the school shows a coworker complained Bryant sexually harassed her. After another internal investigation, the school told Bryant to attend mandatory training. Two years later, in 2013, another coworker reported Bryant for an inappropriate comment. The university’s investigation concluded the impact of his comments were overblown despite using words like “f****” and “p***y” during a work meeting with his subordinates. And then, in the middle of the case involving Shanae Hall's daughter in 2018, another student reported that Sgt. Bryant made inappropriate contact with her. The university found sufficient information to support the claim and finally suspended Bryant for four days. Sgt. Bryant and his attorney declined to comment on any of the allegations. In a statement, his attorney said, in part: "Mr. Bryant and I respectfully decline to comment at this time. We try cases in the courtroom, not in the media. I sincerely appreciate the consideration." Both Fort Valley State and the Georgia Board of Regents also declined repeated requests for an interview on how they handled the decade of complaints against Bryant. "Thank you for reaching out. We do not comment on pending litigation or personnel matters. This includes interviews with the staff representatives indicated in your requests," the Special Assistant to the President for Strategic Marketing and Communications at Ft Valley said in an email. The Vice Chancellor of Communications at the University System of Georgia (USG) also responded to our interview request to the Board of Regents by saying "I received your question regarding FVSU. However, USG does not comment on pending litigation." None of the sexual misconduct complaints against Sgt. Bryant were ever mentioned in his annual reviews. Instead, for 10 years, bosses praised him for his work ethic and promoted him while women on campus, students and his own staff, complained repeatedly. “Put it another way, if my children were attending Fort Valley, I'd be gravely concerned - particularly if they were young women,” Lewis said. The law has since caught up with Sgt. Bryant. He was booked into the Peach County Jail and charged with three felonies including violation of oath by a public officer. The GBI still has an open investigation into the case. Bryant hasn't yet entered a plea, since the case has yet to be arraigned, according to the Peach County District Attorney's Office. In the meantime, the university allowed Sgt. Bryant to resign soon after the freshman came forward with her recorded phone call. Bryant's alleged victims say the university should have fired him instead.